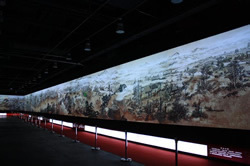 Visitors are able to experience an extraordinary new Chinese exhibition titled Old Beijing Gets Moving, projected on a multi-faced 228-meter-long screen. This animated exhibition takes as its inspiration A Glance Round Old Beijing ‒ originally created as an extended scrolled image by the painter Wang Daguan. New life is breathed into old paintings by Panasonic projectors. 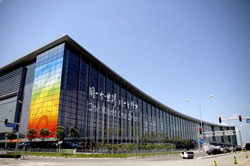 China National Convention Center (CNCC) officially opened in October 2009, to provide international standards in its purpose-built convention and exhibition facilities. Featuring a prime location and complete facilities, CNCC is China's most versatile venue ‒ ideal for congresses, meetings, exhibitions and various events. CNCC is also proud of its stunning architectural design. Its front appearance resembles traditional Chinese quoins. It illustrates rich Chinese history and culture, incorporates both tradition and modernity, and creates a bridge to the future. The multimedia content "Old Beijing Gets Moving" recreates Wang Daguan's original painting, which is a famous panorama of 1930s Beijing titled "A Glance Round Old Beijing." This moving painting is 3 meters high by an astounding 228-meters-long. Numerous ancient buildings and people are intricately portrayed to produce a lifelike depiction of Beijing streets and neighborhoods in the 1930s. The imagery is universally praised as an extraordinary achievement of digital programming and animation. In order to faithfully reproduce these images, bright, high-definition projectors with excellent color reproduction capabilities were required. 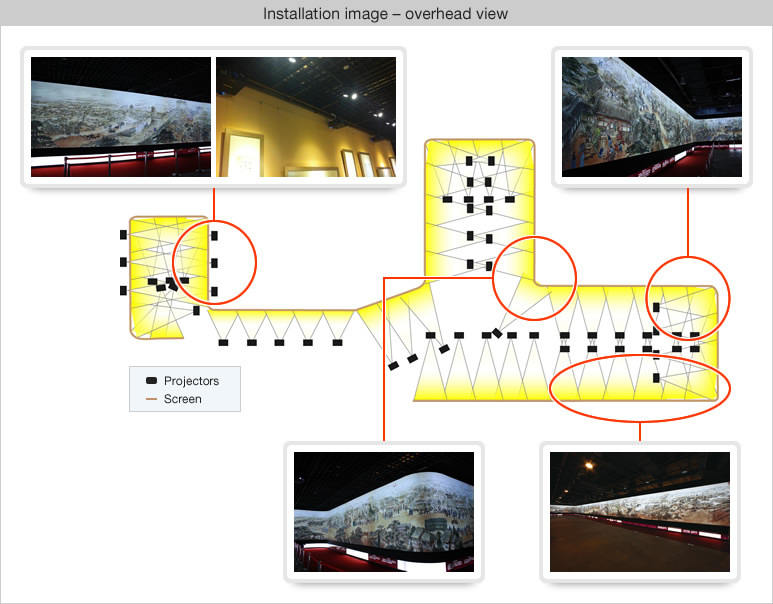 Edge blending and color matching technologies were applied, and projectors were sought that would be appropriate for multiprojection on a 228-meter-long, flat and curved screen. Stable operation and low maintenance were also essential requirements for using a large group of 56 projectors to provide a display on large-scale screens for a long period of time. The PT-DW6300 projectors ensure high reliability and fulfill the requirements of professional designing teams who are experienced in larger exhibitions. A multimedia installation of this scale was accomplished by Panasonic PT-DW6300 1-chip DLP™ projectors. These projectors offer features (such as RGB Booster and Detail Clarity Processor) that enable them to project bright, high-definition images. They are an excellent choice for projecting the images of Old Beijing Gets Moving. Also, in addition to its excellent dustproof performance and Auto Cleaning Filter, the PT-DW6300 features remote operation and a maintenance alert as part of its Web Browser Control function. This greatly reduces the hassle of maintenance and simplifies control, operation, and continuous large-scale displays involving 50 or more projectors for extended periods of time. Projection on the multi-faced screen. Seamless projection was achieved by the use of edge blending and color matching. 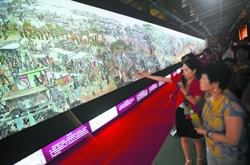 Visitors to the exhibition are greeted by a remarkably long projection screen that allows them to embark on a journey around old Beijing. Old memories come to life once more through the power of new projection technology, and promote the development of creative culture in Beijing. * The product number in China is PT-FDW635.